“I’ve always struggled with developing sustainable nutrition habits. I began working with Sara and have since achieved terrific results. I’ve lowered my body fat percentage, and I’m more confident and knowledgeable when it comes to grocery shopping, cooking, and ordering at restaurants. Working with coach Sara has undoubtedly changed my life for the better, and while there will always be room for improvement, she has helped me build the foundation on which those improvements can and will be made." Honesty - This is a partnership built on trust. In order to help you to the best of our ability, we require an accurate account of “what” and “how much” you’re eating. We promise to never shame you for diet mishaps, and in return, we ask for your full honesty and disclosure. Commitment - We can provide all the tools, guidance and support for success, but we cannot do the work for you. We will be with you every step of the way, but you must commit the time and effort required to reach your goal. Humanity - You are human and will make mistakes. No one is perfect and we will never expect you to be! Don’t let slip ups impact your confidence or commitment to your goal. Learn from it and move on to the next healthy meal! First, check out our FREE Nutrition Workshops! 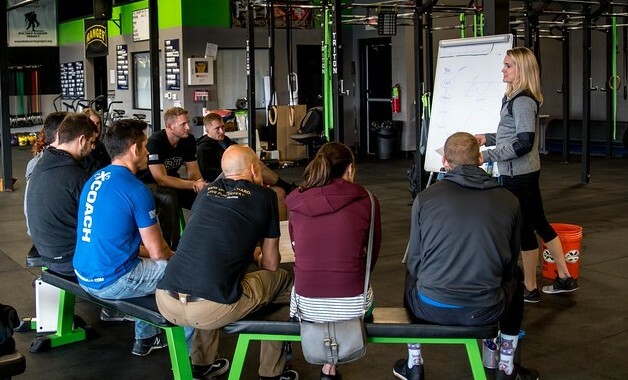 Whether your goal is to lose body fat, gain muscle, run your first half-marathon, PR your back squat or anything in between, smart sustainable nutrition is the key. Our FREE nutrition workshop, which is open to the public and anyone interested in learning about healthy living, provides all of the information and tools necessary to make real change. We know change can be extremely challenging and we are here to help you if you need more. If you're looking for REAL RESULTS, choose CFK Shred. Anyone wanting to dominate life into their 90's! CFK Shred starts with establishing a baseline calorie requirement using custom, personal data from our Fit3d Scanner (See before and after pics and link below), not a random formula based on height and weight. From there we figure in your activity levels and develop a macronutrient ratio that will reset your metabolism and turn your body from a sugar-burning to a fat-burning machine. We will NOT continuously restrict your caloric intake, risking permanent damage to your metabolism and bad relationships with food. We won’t shame you if you have a bad meal or eat processed food, but at the same time, we are not going to pretend it’s ok long term. Our nutritional prescriptions are firmly based on the principle of whole foods first, consumed in quantities that support activity levels but not body fat. Step 2: Nutrition Plan - Your coach will tell you how many grams of protein, fats and carbs you need to consume daily based on your bio-individual needs and goals. We do not provide meal plans but will help you structure your first week, and provide sample meal suggestions from your template. Step 3: Keep track - Chart your progress in My Fitness Pal where you will log your starting weight, enter your coach provided nutrition goals (macronutrients and calories), and log daily meals. Step 4: Gain a support network - Stay accountable with weekly one-on-one check-ins via email, access to our members-only Facebook page, and anytime access to your coach via text/phone/email during the week with any questions/concerns/obstacles you face along the way.